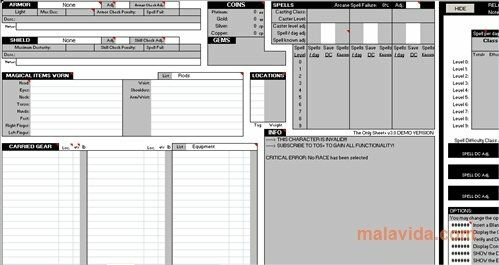 In any role-playing game (RPG) the creation and maintenance of a character sheet is of the utmost importance, and to improve and control this aspect The Only Sheet can give us a helping hand. 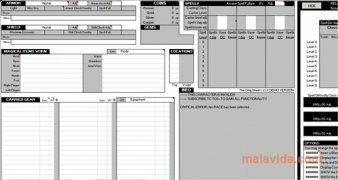 This Excel spreadsheet uses the macros of the program by Microsoft to obtain, calculate and show the data that is necessary to any player of this type of games. This spreadsheet can be used by the players to keep track of their newly created character while it advances in level as a house tool, or it can also be used to keep track at all times on a laptop during the game, because it allows us to quickly apply conditions. To create the character, the application allows you to configure what equipment the character is using, the spells that he/she has memorized, the treasure, and other important features. The spreadsheet includes the relevant information for all the data introduced both in the three basic books for D&D 3.5 (Players Handbook, Dungeon Masters Guide and Monster Manual) as well as the Pathfinder Role-Playing Game Core Rulebook. 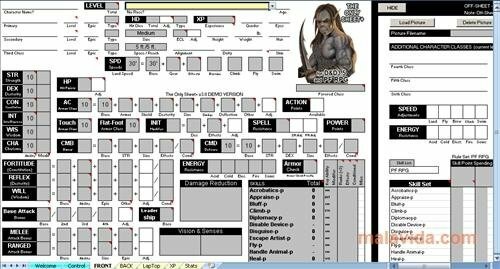 Once we have all the information we need on the character sheet, we will be able to choose what pages we want to print, thus allowing us to print just the general player character sheet, or also all the additional pages that we may need to have available for our gaming sessions. 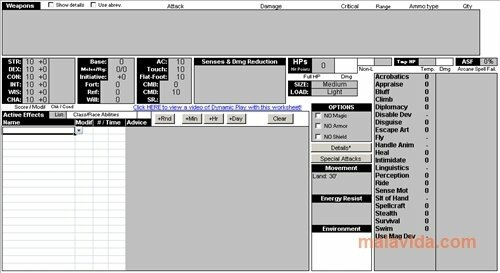 Furthermore, The Only Sheet implements a system to detect errors during the character creation, that will help us avoid awkward surprises when we start playing. This download requires a ZIP compatible compressor. It is only compatible with Microsoft Excel 2000 or above with the Macros activated.